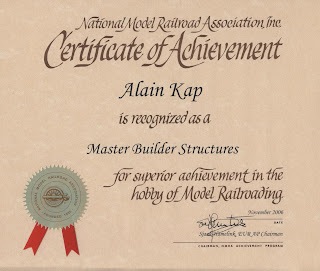 In November 2006, after sending all documentation together with a Statement of Qualification (SOQ) to my AP chair, I received my first certificate in the Achievement Programm of the NMRA. 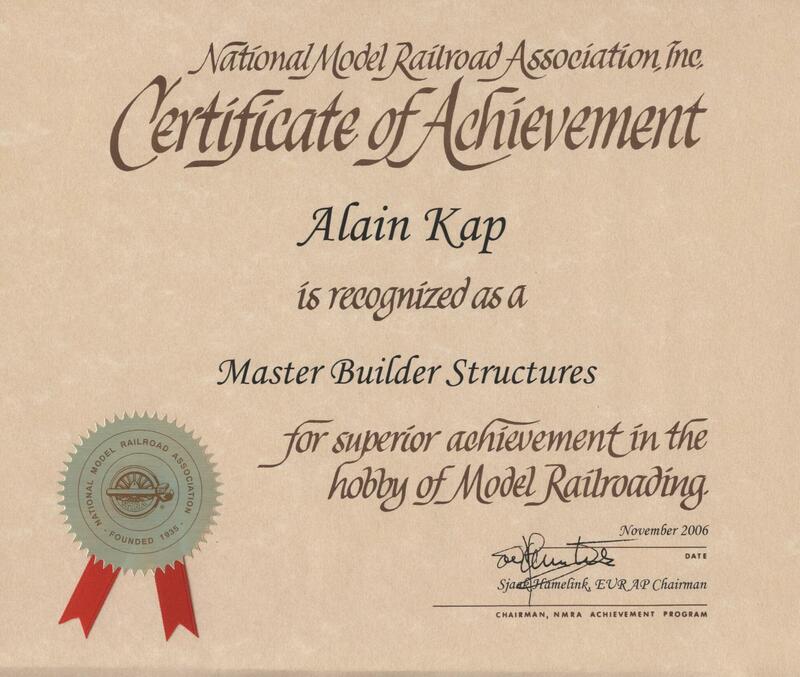 In three years I had built the twelve required structures and submitted them for judging at either a convention or NMRA sponsored event. In my previous posts I listed the structures which earned a Merit Award first and followed by those not getting the minimum score. I must admit that the models were not judged in this order. As I tried out various techniques, some were more sophisticated than others and thus made the difference between Merit Award or not. This is also the reason why I submitted them all to the judges. Twelve structures are quite a lot and it pays to plan ahead either by choosing the right model and the different construction steps. It is not necessarily the most complicated model that makes it. Even very simple or kitbashed models may earn at least 87.5 points. It depends on how much care is given to construction, detail and finish. If you are not sure, (like I was) try to scratchbuilt all of your models. This places you immediately in a higher level in the judging matrix and therefore to better chances in reaching the score. Choose a structure of your favorite prototype. Chances are that you have a good knowledge about your prototype so that you don't have to research everything anew. Recreating the model following the prototype, with accurate look (prototype plans), paint, letterings etc, you almost get the maximum points in that category. Don't forget to include as much documentation like photos (color if possible) and plans as possible. Don't assume that the judges know the prototype as well as you do! Construction usually is the category with the most available points. There are some specific but often overlooked points, that are normally checked first by the judges. - Is the model square? Out of angle corners or leaning walls make you loose points. - Are the windows square and in line? This is probably the toughest thing to achieve.Although there are several ways to model window- and door openings, I always tried to make them a bit smaller so that I could file them square before inserting the window (I always used Grandt Line window and door castings) You may model these also from scratch to earn you more points. - Are the seams tight? Try to get a tight fit when joining the walls at the corners. If you include a floor or glue the structure to a base, avoid gaps between the walls and the base. Check if the roof sits tight on the outside walls. Apply glue very sparingly to avoid that the excess is oozing out. Details, details, details .... If possible add an interior to your structure. There are many interior details available, ranging from furniture to workshop installations. But of course you may also build them from scratch. Take a close look at the prototype or the pictures. There are power meters, gutters, downspouts, antennae, lights (usually over doors) and don't forget the door knobs. Also take care of the finish. I usually use an airbrush to paint my models because it gives a thinner and more even coat than with a simple brush. This might work better on wooden structures than on styrene where the brush tends to leave paint streaks. On wooden structures, the boards are normally nailed or screwed to their supports. So inculding the nail holes adds you points. There are punching wheels with different spacing of the spikes for easy punching along a straight edge. But you may as well use a fine tipped pen or a needle to punch the holes. Always use a ruler or straight edge to keep in line with the support underneath. Good luck and have fun building your next structure.